The American Heart Association says effective CPR can double or triple a heart attack victim’s chance of survival. However, only one-third of victims receive CPR from a bystander. Northeast State, the Greater Kingsport Family YMCA, Parish Nurses, and The Neil Danehy Heart Foundation want to improve those odds. To do so, they recently joined forces and resources to provide affordable, convenient CPR training. The partnership was spurred by Delores Bertuso and Joy Eastridge, Parish Nurses for St. Dominic Parish and First Broad Street United Methodist Church, respectively. The nurses needed a central location that would have space to train, to store CPR manikins and supplies, and to allow for regular scheduling of monthly classes. After a bit of networking and the pooling of resources, a plan came together. 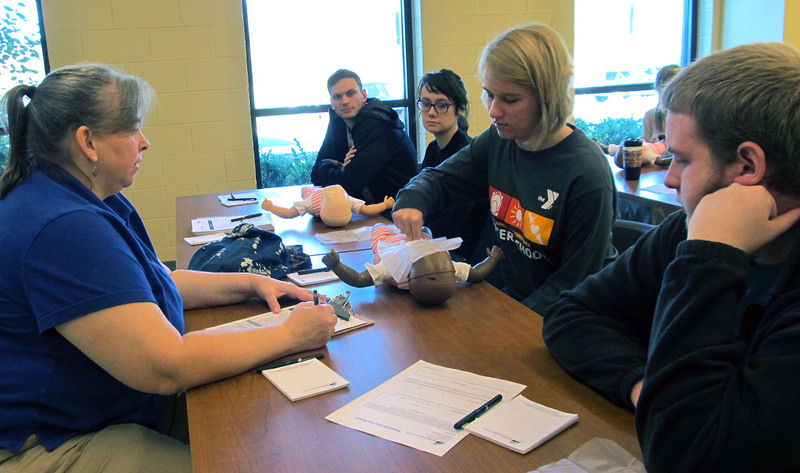 Northeast State stepped up to provide the administration of CPR classes, the Kingsport YMCA donated a designated space for instruction, and The Neil Danehy Heart Foundation funded the manikins and supplies for training. Danehy’s husband, Neil, died of a sudden heart attack in 2005, just two weeks after his 50th birthday. Danehy, along with family friends and daughters, Rebecca and Leslie, created The Neil Danehy Heart Foundation in 2006 to increase awareness of heart disease and provide CPR training. All funds raised by the Foundation promote heart health and provide resources to the community. CPR training gives students the ability to save lives. The Foundation funded eight complete training sets, which include eight adult manikins, eight infant manikins, AED trainers, and associated equipment and supplies. The Greater Kingsport Family YMCA, which opened its new facilities in May 2013 on Meadowview Parkway, provided a central location by donating use of its large community room for free. The location is easily accessible to most of the Tri-Cities as well as Southwest Virginia. The room also provides a secure storage space for the manikins and supplies. Weaver also said the partnership is perfect for the Kingsport YMCA, allowing its employees to receive CPR certification or re-certification on site. 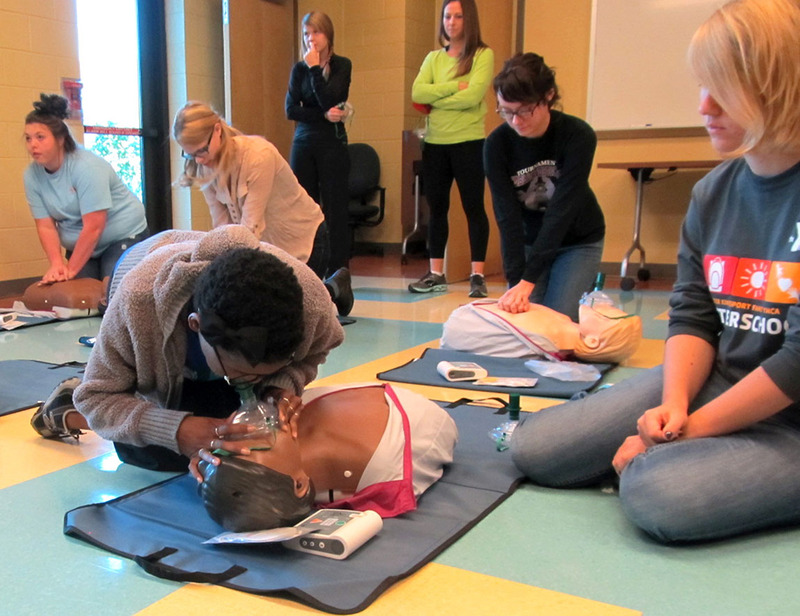 CPR students put their new skills to the test. Northeast State joined the partnership to administer the program. Tasks include scheduling classes, registering participants, arranging for instructors, issuing certificates to participants who complete the course, and replenishing supplies. There are two types of CPR training offered: Heartsaver® CPR AED and Basic Life Support (BLS). Bertuso said the Heartsaver® class is geared for laypersons, while the BLS is aimed at health-care professionals. Heartsaver® is a video-based, instructor-led course that teaches adult/child CPR and AED use, as well as how to relieve choking. BLS provides training in how to recognize several life-threatening emergencies, provide CPR, use an AED, and relieve choking. BLS also requires a written exam. Parish nurses teach the Heartsaver® classes, while Northeast State arranges for BLS instructors. Currently, the classes are taught on an alternating basis the first Thursday of each month from 6 p.m. to 10 p.m. BLS is on the schedule for Jan. 8 and Heartsaver® for Feb. 5. Also, the College can schedule additional classes for groups or companies on an “as-needed” basis. The Heartsaver® fee is $25, while BLS is $50. Bertuso said classes can handle 6-8 persons per instructor. To register for a class, contact Diana Harrison at 423.354.5520 or dlharrison@NortheastState.edu. Filing out financial aid forms doesn’t need to be a hassle. Northeast State wants to help students get FAFSA registered and their money secured with FAFSA Days scheduled now through February 15. Sign up online now at www.northeaststate.edu/financialaid to make an appointment date and get a list of items needed to register with FAFSA. Northeast State staff are also happy to help walk-ins to the FAFSA during lab hours. Students visiting the lab without an appointment are asked to visit Financial Aid web page to learn what documents are needed to register. – January 17, 10:00 a.m. – 1:00 p.m.
– February 15, 1:00 p.m. – 5:00 p.m.
For additional information, contact the office of Financial Aid at 423.323.0252 or visit www.northeaststate.edu/fahelpcenter. 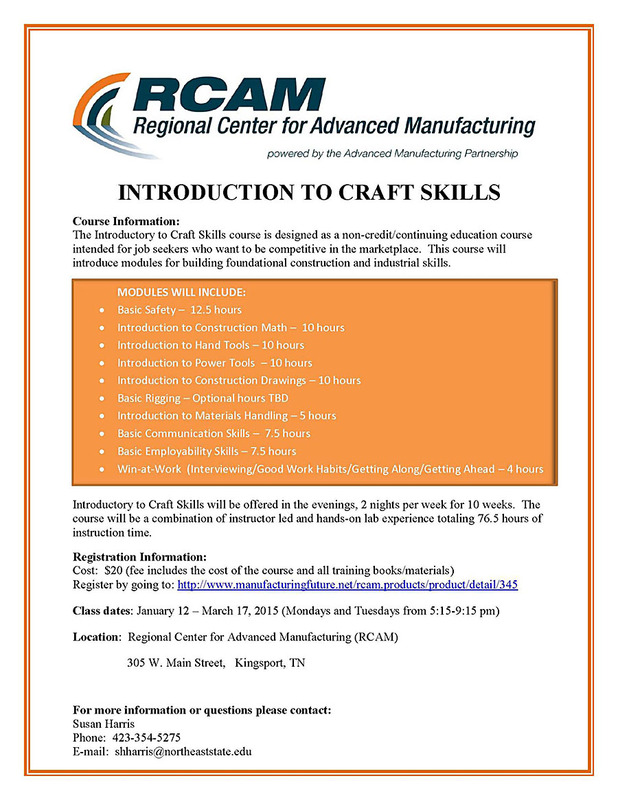 The Regional Center for Advanced Manufacturing (RCAM) offers the “Introduction to Craft Skills” class beginning Jan. 12. The continuing education course presents learning modules for foundational construction and industrial skills. Topics covered include basic safety, using hand tools, power tools, reading construction drawings, and basic rigging skills. Classes will meet on Monday and Tuesday evenings at RCAM from 5:15-9:15 p.m. through March 17. The cost is $20 covering the course and learning materials. For more information, click the course flier. To register, contact Susan H. Harris, RCAM Programs & Services Coordinator, at 423.354.5275 or shharris@northeaststate.edu. 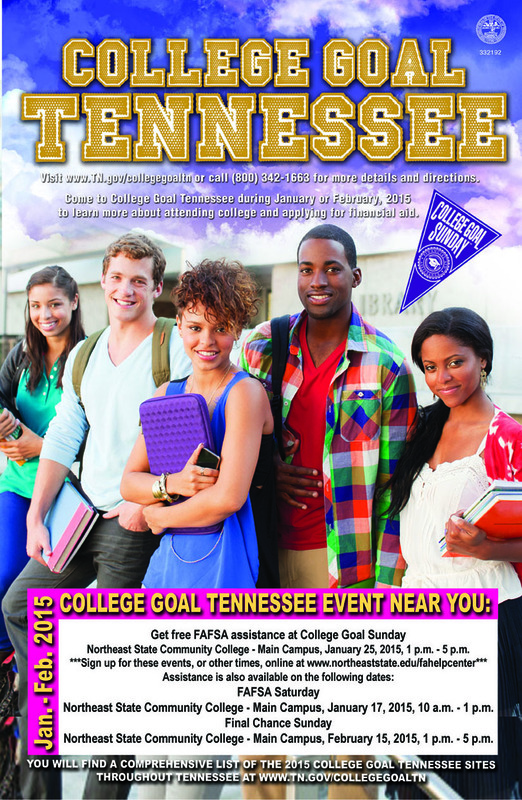 Students searching for financial aid to attend college need financial help now more than ever. It’s never too soon to submit a scholarship application to Northeast State for the 2015-2016 academic year. The Northeast State office of Scholarship Programs administers more than 175 Foundation-related scholarships to help students pay college expenses. Foundation Scholarships may fund maintenance fees and even textbook costs for recipients. Northeast State also administers the Academic Work Scholarship and the Educational Access and Diversity Scholarship programs. The application deadline for Foundation and Academic Work scholarships is March 1. Northeast State awards scholarships to qualifying applicants following a competitive review process. The scholarship application qualifies a student only for Foundation and Academic Work scholarship consideration. A separate application must be completed for the Educational Access and Diversity (June 1 deadline) program. Students applying for state or federal financial aid must complete the Free Application for Federal Student Aid (FAFSA) online at www.fafsa.ed.gov. To apply for available Foundation and Academic Work scholarships, visit www.NortheastState.edu/scholarshipprograms/, click Internal Programs and Apply for Northeast State Scholarships links, and complete the Online General Scholarship Application. For information, contact 423.279.7637 or e-mail scholarships@NortheastState.edu.